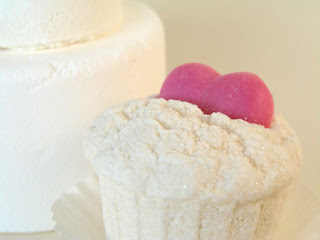 Bath fizzies – good enough to eat! Super cool Bath fizzies! with icing! We suspect that the icing is made with a baking soda, water type mixture and then piped on. Anne-Marie actually tasted some, much to the dismay of her hubby, and that’s what she determined. The bath fizzy in the middle is an adorable two bath fizzy wedding cake. It’s very simple but gets the point across nicely. To the right is a close up of one of the fizzies with a little heart soap detail set in the top. 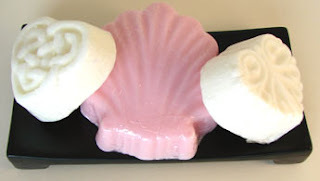 And finally we have a couple of samples of cute little bath fizzies made using a guest size soap mold (below). 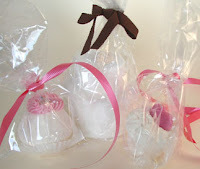 The pink soap and bath fizzies were made by Linnie S. in California who always sends us the most fabulous gift packs – thanks Linnie! Hopefully, you can see that despite the fact that most bath bombs or fizzes are sold in sphere shapes – you can really use any shape you like! I would like the icing to bubble. I don’t want to use SLS or SLSa. Can I add bath gel base instead? What is this icing made out of?